Plant containers and small gardens are a match made in heaven! Nothing can dress up a small landscape more than a few well chosen garden pots, and nothing in your garden is as versatile in application. or material... each contributes it's own measure of glory to the garden. Due to their visibility, associations, and portability, containers often help meet a clients most important needs. Whether of wood, stone, metal, or fiberglass, these denizens of modern gardening rule the roost when it comes to adding interest and function to the landscape. Flowers and foliage in urns, jugs or pots refresh and entrance or gate by offering interest in the form of color, texture and form. Plant in pots can house small trees, vines or flowers, and can help to create a refreshing cool sensation as you approach the house. 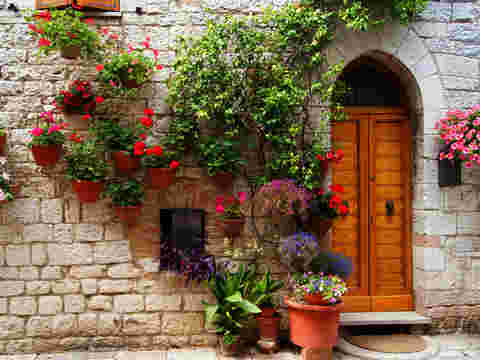 Consider creating a beautiful grouping of plant containers near an entrance to add curb appeal. Use containers as focal points in the landscape. 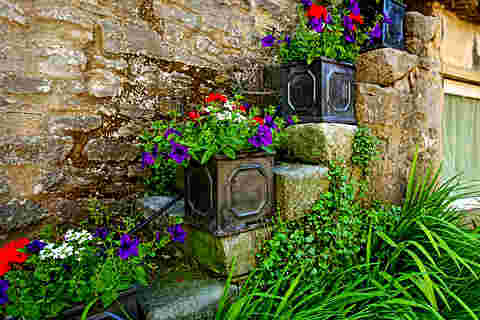 Large scale urns, colorful containers or wildly exuberant textures arrest the eye and provide the perfect solution as an axis around which to plan your small garden design. Containers offer great opportunities as hidden storage! Store compost, potting soil, tools or pesticides in large urns or wine barrels. Add a bench to store garden tools and hoses away from sight and away from weather. Create a water feature with an urn! 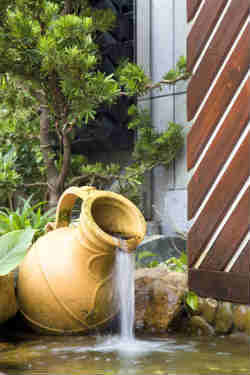 Water features add sound and movement, and these small water features are inexpensive to install and easy to maintain. Find creative ways to bring water to the garden through creative use of containers. Evoke a mood by selecting plant containers that stimulate associations. Like a little modern flair? Choose bold, geometric containers and arrange them asymmetrically. Prefer a traditional look? Use interesting clay pottery or historic designs to evoke a sense of permanence and times gone by. Or maybe you are all about a functional landscape? Find an old horse trough or washtub and set the tone! Create balance by massing containers or using oversize plant pots in your garden. Group plant containers to create masses of color or to add volume to the landscape. Skillfully grouped containers add variety wile maintaining unity through color, material or textures. Grouping containers along a blank wall will provide interest and reduce its impact on your garden. Does your house wall feel like the Tower of Babel next to your small garden? Add a long, dense line of incredible pots along an existing axis that extends out from the wall and watch it diminish the impact of that wall. Maybe you have a huge fortification of tam juniper that guard the front garden, left to plague you by the previous owners? Set up interesting pottery at a regular interval throughout the juniper display, and suddenly that wall become a feature rather than an eyesore. Use pots to extend the seasons, or even practice zonal denial. Since containers are so easily portable, they can easily be moved out as plants decline or the seasons advance and Mother Nature no longer nurtures that exotic, and definitely NOT native, garden prima dona. Replace it with a newly planted container and the garden misses not one moment of it's fleeting beauty. 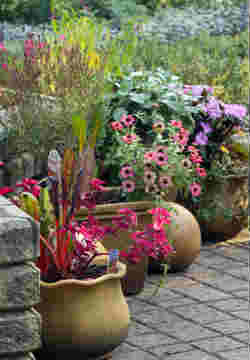 Spread pottery and pots throughout the garden as decorative features. Line them up along steps, on table tops, along the tops of walls. Group them on the patio or hang them in the trees. Make containers work for you! As you work with plant containers in a small garden, remember to unify your choices through materials, textures, colors or shape. Keep this in mind, and you can continue to add containers as long as you have room! Plan for a place to shuffle them away from sight during their fallow season, and bring them on stage again as spring appears on the horizon. you want to create in the garden. If you have a small garden, and not a lot of budget, the fastest and most inexpensive way to create a jewel-like landscape is to add a few well chosen pots as features. Create the style now, and add the features later. It is a great way to feed the plant beast while you save for that great architectural feature you have planned! Whatever your style, consider designing with containers as an option. You'll find your style quotient soaring!